Napa and Sonoma Valley are the premier destinations for luxurious wine-oriented vacations. Visitors travel from across the globe to sample the fine wines, explore the romantic scenery, and to relax in any of the region’s secluded spas. Napa Valley has grown over the past 35 years from a valley with as few as 35 wineries to today’s tourist attraction of more than 400 wineries. The wine industry has become an invaluable part of the region’s economy. Napa Valley and Sonoma County produce a wide variety of wines, depending on the microclimate in which each winery is located. Napa Valley is located alongside Sonoma County to the east, where inland fog becomes trapped and lingers until the afternoon sun burns it off. Most wineries are open to the public daily, but be sure to call in advance as some require appointments. Napa Valley: For a detailed list of Napa Valley wineries, visit NapaValley.com. The best way to see the scenery, sample a variety of wines, and visit different wineries is to hop aboard Napa Valley Wine Train! Napa Valley Wine Train: The Napa Valley Wine Train is a 3-hour train tour of Napa Valley’s historic wineries and surrounding areas. The tour begins in historic Napa before traveling through three other towns on its way to St. Helena: Yountville, Oakville, and Rutherford. The train stops at various wineries, depending on the day of the week. Guests can disembark at these locations if they have purchased tickets to tour the winery. The Wine Train itself is comprised of 9 cars with wide windows to allow for optimal viewing of the area’s classic vineyard-covered rolling hills. See numerous wineries while sipping chardonnay or merlot. If guests wish to drink wine while on the train, they must select one of the packages that provide different types and quantities of wine. Think wine is the only thing Napa Valley has to offer? Think again! Visitors delight in hiking, taking hot air balloon rides over the valley, and in relaxing during a day at the spa. 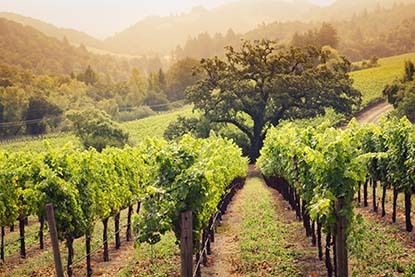 Whatever activity you seek, Napa Valley has the best to offer. Calistoga Hot Springs: Relax at the Calistoga Hot Springs! Take a mud bath, settle in for a soak in the spa, or dip into the naturally heated mineral pools. Select a massage after a bath treatment for the ultimate relaxation to a luxurious vacation getaway. Old Faithful Geyser of California: Located in Calistoga Springs, the Old Faithful Geyser of California erupts at regular intervals of about 30 minutes. This faithful geyser sends a scalding column of water into the air 60 to 100 feet. The geyser can be seen from the surrounding hillsides during a hike, or up close in the park itself. The geyser has been known to predict earthquakes, based on the delay in its average eruption intervals. For a list of Sonoma County wineries, visit BestInSonoma.com Sonoma County may offer some of the best wine in the world, but the fun doesn’t stop there! Take a private winery tour or visit a redwood forest! Amaxlimo: Tour Sonoma County Wineries in style! Tour in a limousine for private groups up to 12 people. Ideal for those seeking a tasteful and exclusive experience, these limo tours showcase the best wineries the area has to offer. Guerneville: Armstrong Redwood State Reserve is quieter and less crowded than Muir Woods, Armstrong Redwood State Reserve is a restful alternative to its more popular counterpart. Six hundred acres of towering redwoods shade a lush fern understory. Several easy hiking trails explore the park, allowing for visitors of all ages to appreciate the scenery. San Francisco: offers countless tours, attractions, and other activities for newcomers and returning travelers. Located just an hour from wine country, this city’s famous landmarks are a must-see before you return home. The Golden Gate Bridge: The Golden Gate Bridge is San Francisco’s most iconic landmark. Whether the sun is shining or fog is streaming through the bridge’s awe-inspiring arches, the Golden Gate Bridge is a must-see. Spanning 1.7 miles over the Golden Gate Straight, more than 100,000 vehicles cross the bridge every day. It is at an average height of 220 feet above the water, a distance that was designed to allow navy ships unencumbered passage beneath the bridge. It is currently ranked as the 9th-longest suspension bridge in the world. The bridge was painted International Orange in order to blend in with the natural warm earth tones of the surrounding hillsides and to increase the bridge’s visibility in the Bay’s infamous fog. Shop at Union Square: San Francisco’s #1 shopping destination! The Square is home to hundreds of retail stores, restaurants, hotels, theatres, boutiques, and more! Palm trees, manicured hedges, and spacious seating options create an open space in the midst of bustling activity. Visit for a day of shopping, to attend a free event, or to take in the sights! Chinatown: is one of San Francisco’s most popular attractions! Drawing more visitors yearly than the Golden Gate Bridge, Chinatown offers fascinating novelty items, cheap and delicious Chinese food, and a variety of cultural attractions that illustrate the uniqueness of San Francisco’s Chinese community.